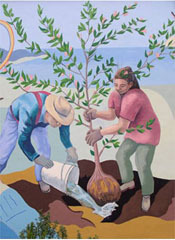 Sanchez Art Center is proud to host a Main Gallery exhibition by 2010 and 2011 Rydell Fellowship award winners Andrea Borsuk, Tim Craighead, Victoria May, and Andy Ruble. The exhibit opens on Friday, June 1, with a reception for the artists from 7 to 9 pm, and extends through Sunday, July 1.
on Sunday, July 1, at 4 pm. Andrea Borsuk teases out the most delicate of nuances with her small, sometimes cookie-cutter women’s figures and her images of jewelry and adornment. She combines these in settings that expose vulnerabilities and hint at powerlessness, such as figures on strings being pulled through the air—not quite puppets, but definitely not in control of their own movement. All of this is set against dark landscapes with sunsets, or against blue sky with piled-up white clouds, pictorial representations that hark back to older European painterly traditions. It’s an amazing mix of elements that Borsuk uses to explore feminine archetypes and cultural assumptions about beauty. That she does so with such grace and humor is a real gift. Tim Craighead’s abstract monotypes and oil paintings seem to inhabit a symbolic realm that speaks to the nature of being and nonbeing. Some lines and forms overlap, and sometimes in this layering of the “real,” one sees through to another dimension or a more interior environment where the same form also lives. Certain shapes and figures recur, as in the ribbon-like curlicue that resembles (but is not) the lemniscate, the symbol for infinity—or is it a butterfly? A bee? There are also circles, woven spheres, x’s. We may not know exactly what they mean, but these forms quickly become familiar, a language of symbols we relate to warmly and enjoy seeing again and again. In the midst of exploring the structure and mystery of the universe, Craighead has found warm, intimate moments. 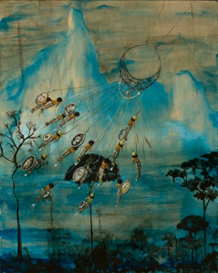 Victoria May’s work was featured on KQED’s Spark program in 2009. 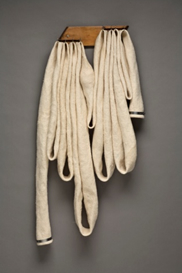 She explores the tactility of the world, using found objects, fibers and textiles, and even dirt. Like Borsuk’s work, some of her pieces express the dichotomy of strength and vulnerability, the delicate and the structural. Finely tuned textures interact with one another in folds or layers, and like Craighead’s work, there are interstices one can see through. 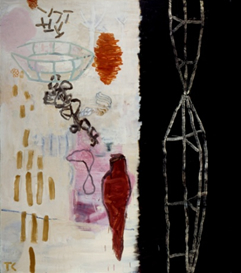 Her work is quiet, yet compelling, so quiet that it almost catches us unawares, yet it manifests the familiarity and the substantiality of all that we depend on in our lives. Like Craighead, Andy Ruble is interested in structure. His ceramic pieces create enigmas and entirely new spaces for us to consider. The heart of his work is the hybridization of organic and architectural structure. Ruble explores the ways that objects in nature and manmade objects reflect the same natural laws, demonstrating in his work how the analogous structures of both are important to the survival of the whole. In other words, his work can simultaneously convey the beauty of natural arches and the grace of cathedral naves, giving a concrete representation of the interdependence of nature and nurture. Sanchez Art Center is located at 1220 Linda Mar Blvd., Pacifica, California, about 1.5 miles east of Highway 1 and the Pacific Ocean. Gallery hours are Friday, Saturday, and Sunday from 1 to 5 pm during exhibitions.